Publish and perish: Liturgical Press published this book in 2016. Doyle died in May, 2017. “Poem for Dave McIrvin” describes the humble approach of a physician whose news for Doyle and his wife will strike terror. “Seanchai” describes the storyteller’s responsibility to grieving families and communities when offering eulogies. Were these poems added after Doyle received his brain cancer diagnosis in October 2016? If not, their prescience is spooky. If so, they are all the more poignant. Quibbles: This largish collection of 89 prose poems holds a range of topics, perspectives, consistency, and quality. Not all of the pieces found a settled and satisfying final form. Sadly, proofreading did not catch a couple of unfortunate errors. Suggestions: Speak these stories aloud to catch the ebb and flow of Doyle’s narratives. The block-form page layout will not help you see the shape of his stories. Breathing them into hearing gives you a sense of their pacing and the depth of feeling that the eye alone cannot discern. So what? Stories seemed to come to Doyle. He was awake with keen awareness to the small things and the fleeting moments of his life. He probed them with curiosity and patience for their kernels of human truth and holy blessing. A deep reverence for the gift of life and gratitude for the people who have been with him during the span of his days comes through this collection. In our season of cynicism, anger, and distrust, these poems can reorient our hearts and minds, revealing the goodness of the people who surround us. 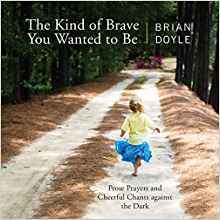 Brian Doyle, The Kind of Brave You Wanted to Be. Liturgical Press, 2016. 124 pages. Rebecca Slough, PhD is Retired Vice President, Academic Dean, and Associate Professor of Worship and the Arts at Anabaptist Mennonite Biblical Seminary.